Good intro to the board, thanks. After reading all of that, I honestly can’t imagine why I’d bother. This Vidor seems like it inherited none of the expected simplicity of an Arduino, and instead just layers more BS on top of the already funky toolchain of an FPGA. That business about the microcontroller and FPGA fighting over IO pins bothered me in particular. Most people here don’t have problems that need an FPGA. And if you do have an FPGA-class problem to solve, is there any reason to use a Vidor instead of one of the myriad FPGA dev boards that already exist? Exactly. 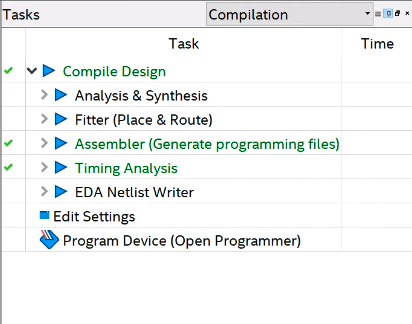 I really can´t see how it will enable existing Arduino user to develop things with FPGA. And for those who already have some experience with FPGA, why would they use that clutter at all, really ? I agree with you dahud, it is not a good way (or low cost way) to get into the fpga world but I will say that once people start creating drivers for it (IF they do) it will be pretty awesome. Agree, it’s a bad design and the added software complexity it brings doesn’t do anyone any good. It would be a bear to use in a real application with such crippled I/O. Overall it reminds me of the el-cheapo throw away eval boards Arrow sells. There are much better and cheaper FPGA boards out there if you just want to play with FPGA’s. The one that Grant Searle uses for his designs is pretty good and can be had on Ebay for about $20.00. A few years ago Max II boards were basically just shipping costs. and max 2 is pretty much a fpga despite being sold as cpld for most intents and purposes. Spot on. I have a few Max II boards and work fine. BTW another option I came across is the GnarlyGrey board. $14.00 and based on the Lattice UltraPlus FPGA. All you need is a micro USB cable and some .01 male headers and you’re in business. They could have at least put a JTAG connector on there. Those with FPGA experience aren’t going to bother with it so only noobs will be writing “libraries” (HDL) for it. I think the value proposition… If it materializes… Is either advanced people writing tools for non FPGA people or someone making a more intuitive IP composer. But yes like it is that’s only going to serve the first group. In all fairness, any time you hook two devices together this could be a problem. Especially when both devices can be configured to drive out read a pin. This is probably an Intel design with an Arduino logo. They’ve done it in the past and these kind of products only exist to say they are exploiting a niche / untapped area, the interest will die off once the project managers find a new useless thing to make and the sales numbers aren’t justifying a 3rd or 4th production run. Intels pretty desperate to work its way back into and ontop of the MCU market, they’d also love to get more people buying FPGAs. They don’t mind using ARM to do both of those things. I wouldn’t be too surprised if the next Intel with an Arduino logo is a indirect competitor to Raspberry Pi, little ARM SOC + FPGA board, Match the Pi pinheaders, chuck in some uno headers, a gig of ram, hdmi out, basic ethernet and or wifi and a big mess of pins just for the FPGA along with a chunky price tag. Awesome Al, thanks. This board is really cool, I hope it becomes popular enough to stay around. I’ve been using the Arrow MAX1000 board recently and this looks like it’d be an easy transition. What is the advantage here over just getting the Intel dev kit? I am mystified Arduino would make this process even worse. AMD FPGAs? What issues does the cyclone have that you’re concerned with? Thanks for the nice article. It’s great to see that even if we as re taking some time to release the full flow there is people like you that loves hacking and sharing. Btw we are finalizing the release of the tools that will enable recreating the libraries we released and with that enable people to modify them easily. Let me remind that the reason it’s taking so long is really that we wanted to simplify things and for those that seem not to see how we’re trying to achieve it let me remind that vidor’s fpga is basically proposed as a way to expand Cortex m0 peripherals with an infrastructure that makes it really easy to add whatever fancy hardware accelerator to your system. If you are just an Arduino user you won’t need to fiddle with RTL and just keep adding libraries to your code. For those willing to use fpga we’re providing an infrastructure that makes things easier and some feee, open source IP blocks also for stuff that used to cost quite some money, like the mipi Rx IP. Finally, the board has provision for JTAG connector but likely you won’t need it as we’re also releasing an USB blaster emulator running on the arm. I know it’s not easy to see the full picture now as we’re taking some time releasing everything but I hope the community will appreciate our work and I’m sure platform will grow also thanks to contributions from enthusiasts such as Al. I’ve worked with FPGAs on a hobbiest level, and they are not straight forward due to the complexity of the dev tools. This Arduino implementation is nothing short of a nightmare as it still forces you to use the same hard to use Quartus tools, and then turns around and adds several layers to get from point A to B. The ONLY way this will work is if someone comes up with a very easy to use tool set. They really need a true Arduino for FPGAs. Nope, we don’t force anyone to use quartus. Indeed we are even preventing use of it by providing precompiled libraries and our intentions, as I wrote, are to give Arduino users the possibility to expand microcontroller peripherals by just including a library. It’s as easy as this. For now it gets complicated only if you want to implement your own IP blocks but we never stated we would solve this…. At most we said, and done, that we would provide open source , tested IP blocks along with software drivers and examples on how to use it. Here we go again… Icestudio is a good tool and I appreciate the effort developers put in it but honestly it’s far from being as strong and powerful as native tools. Try supporting asic grade synthesis, timing closure, BIG and etherogenous fpgas and suddenly you will notice that the software will become complex. There’s a reason why xilinx and Intel are the only two real players in this field and it’s not just because they have great devices but because they put a huge amount of effort on their tools. You may not like the fact they’re closed source and incredibly big but it would be intellectually dishonest to dismiss them as unusefully complex comparing them with a toy like icestudio, that btw supports only a few devices the size of a nail compared to what other commercial tools handle. What’s really irritating for me is to see all these dismisive reactions, especially when (so regular) commentators clearly don’t bother to take into account many aspects of this board and its problematics, even though that thet have largely been discussed in the comment sections of previous related Hackaday’s blog entries, even with Arduino representatives and engineers jumping in to answer precisely to various technical concerns, which is rare and great. Yes, it has been said and debated over and over, and still Dario has the patience to explain it again, as I am : this is not a dedicated tool for electronic engineers, but more of a proposal of “programmable hardware” enhancement to the Arduino ecosystem, aiming to offer a way for most users to keep using ready-made libraries and drivers leveraging the different (powerful) onboard chips. The difference with similar boards is that a big actor of this market, with the (proven) power to establish an actual hardware and software platform, seems, for a change, really commited to provide support for drivers developments. Even if their main focus was something like “we’ll provide our own polished integrated IP blocks so (end) users won’t have to mess with HDL stuff to take advantage of the configurable hardware”, they listened and heard the community (like Al and interested people) who wanted low-level access to make their own bare-metal FPGA programming, and are in the process of deliver just this, which is rare and great too. That said, I want to tell you this, Al Williams : if I salute your efforts to share this particular exploration, since it is mostly based on the work of someone else, please at least NAME this person like it’s usually done on this blog, rather than this kind of vague, kind of embarassing stuff (I quote) : “If you speak french, good news, there’s some information… if your high school French isn’t up to the task, here is the Google Translate link… but I wasn’t content to just read the Google translation”, so here is your take (of the same thing)…. I don’t know him at all, but you can’t ignore than this (french) guy has, for some times now, been very active in obtaining the required informations and files on the dedicated Arduino forum, prior to publishing the very first available tutorials (while in french) last september. It just takes a few seconds to find that the name is Philippe Boudot. Many thanks to him for this particularly useful involvement (and the good news is he was even able to let several comments, in a perfectly readable english, right after your previous article on the matter, if you didn’t notice). Well I’m sorry you feel that way. I don’t think anyone reading it with the link and the detail discussion of what was changed would have thought for one minute that I was saying this was original work and I’m surprised you did. As I mentioned in the article what I did do was breakout the user part of the verilog and create a much simpler fpga example that directly supported people who already know hdl. I also replaced the Java program so people didn’t have to install the latest Java just to run a 5 line script. And I put it all in a GitHub repository so you didn’t have to go download from three or four different links it could be kept up-to-date. I ever forked the original code to make absolutely sure that nobody thought I had just produced that out of thin air. Okay granted I didn’t name someone in particular but I would think between the links the commentary and the git chain it was abundantly clear. Kind of how open source stuff works. Thanks for your answer, I still haven’t study your presentation further because I was unhappy that you failed again to name this foreign blog’s author, one you already refered to previously in the same rather anonymous way. I’m sorry you feel like justifying so thoroughly the simple omission of a rather basic courtesy. Open source surely works a lot better when credit to similar work is given, and usually it is standard practise on Hackaday (and historically in the scientific field) when referering to some original work, even if it is to improve on it, even quite differently and presumably better, and your message summarize this well. Now, regarding the very dubitative reactions about this “FPGA” solution and its problems, I understand most of them, but as the conceptors and manufaturer seems to show interest in our advices, I would prefer a more constructive approach like telling in which ways it could be improved. Thank you for your nice words. I totally agree that constructive feedback is the best way to go and I’m really open to listen, as you also probably noted by looking at the arduino forum. Unfortunately it seems like some people reading hackaday just don’t like Arduino because it is lame, because it’s too simple or any other reason that just doesn’t take into account the simple fact that we’re trying to allow use of complex stuff to people that would never even have a chance to get in touch with it. Yes, there are extra layers of software and yes, there are things you could optimize more if you know what you’re doing but no, we don’t force anyone to use our software and if you really want you can even wipe out our bootloader and program bare metal on our boards. Having said this I know some people will still dislike what we do, probably without even having ever dug deeper on Arduino philosophy but it’s fine.. probably those guys think it’s better teaching a first time biker with a reckless downhill descent rather than starting with trainer wheels on a flat track. Maybe they’re right and some people will learn faster but we’ll keep going our way while we see that it produces good results on most people. Regarding your discussion with Al I think every contribution is good and although Philippe wasn’t explicitly named his work was clearly referenced so IMHO there’s no bad intentions here. Again, anyone can be told he could do better afterwards but he did great and to paraphrase your words, let’s be constructive. Is there any plan to standardise an add-on board form factor for the mini pcie connector, as I would like to make one soon? Unfortunately official support was quite dismissive of my question.. Thinking of a SATA adaptor so I can do streaming of video from MIPI to SSD with CV stuff in between. Hi, sorry you got impression official support was dismissive as I’m trying to address all questions in depth. Right now there is no finished plan for mini PCIe add on boards. We’re looking for a solution that allows reusing also mkr pins but insertion is a bit tricky. Note that our mini PCIe interface only supports USB so no high speed lines are in there and a SATA adapter would have to go through a USB based controller. Btw if you want to have an in depth discussion on these topics I would recommend to move it to the dedicated Arduino forum (https://forum.arduino.cc/index.php?board=125.0) where we’re capturing users inputs and where we can track discussions in a more structured way. So first of all, huge thanks for an excellent article. I really like the idea, speaking as an ex-FPGA designer, currently BSP SW engineer. Often in my recent work as a SW engineer, I find that I’m missing an FPGA honestly. Not so much for the actual functionality as much for increased testing flexibility, especially if we’re talking automated testing. This is where Vidor would shine. I think it could be used as testing equipment quite nice and also could be used for fast “small-module” bring-ups quite efficiently. Not to mention production testing. It is also relatively cheap… I really see no downside, except that the IDE, as with all FPGA devices needs to mature a bit. Now I’m not sure why there are so many negative comments – I guess people are still afraid of the FPGAs, since they seem to mention “funky IDE”, issues with Arduino conversions, saying “real” FPGA designers would not touch Vidor… I guess none of these guys had any experience with FPGAs, otherwise they would know how it goes with Altera (I’ll never say Intel :) ). I’ll just say this – you need to send at least one service ticket to Altera in order to be called “FPGA designer”. 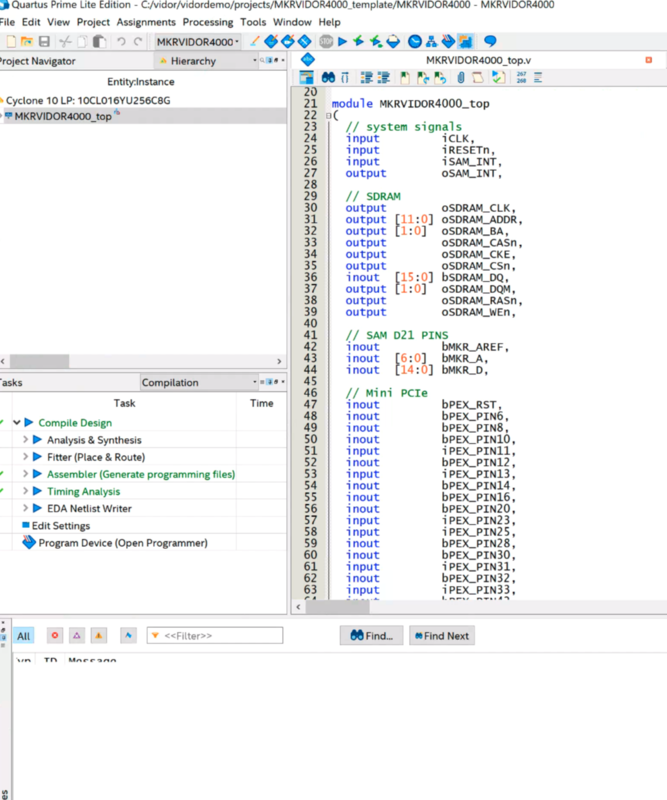 Those that know SOPC Builder and how Qsys behaved in the beginning will know what I mean ;) And I think it would be quite an interesting device for “real FPGA designers”.